Just cleaned out an 85-year-old garage in northern Wisconsin. 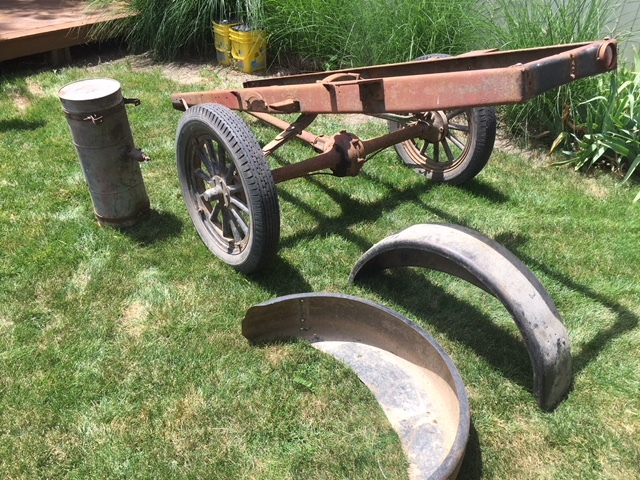 Would appreciate any help with identifying this chassis, running gear, fenders, gas tank and wood spoke wheels from what appears to me to be a Model T truck. Thank you in advance for any help you can give me finding a value and buyer. Looks like a good start to build a trailer. I am interested when you find out what you want for it. Hello Bob, This whole Running gear was a trailer to haul building materials to a cabin site and later to haul boat to a river. I have a black-and-white picture of it sitting in front of my family cabin in Hayward Wisconsin still under construction in 1935. It has been there ever since. Just tore the old wood top off of it a few years ago to bring this chassis home. The chassis has been modified for a trailer and the rear end is unknown as far as it's internals. If the gas tank was clean inside maby 50 bucks, rear end maby 50, wheels maby a 100. fenders if they are in good shape maby a 100.
just rough estimates But the chassis is worth saving as folks make T era trailers at times. Looks like a 13-14 rear. Looks like a 1913-14 riveted rear end. Note the accessory truss. Better/closer photos off the differential and driveshaft would be helpful. if that's an early rear axle (and it looks like it is) value would be somewhat higher! Looks like it may have a taper spring too.